Freddie Ramos loves his new Zapato Power—super hearing! He can listen in on conversations and find hero jobs. But soon Freddie realizes the temptation to eavesdrop on everyone is too great. 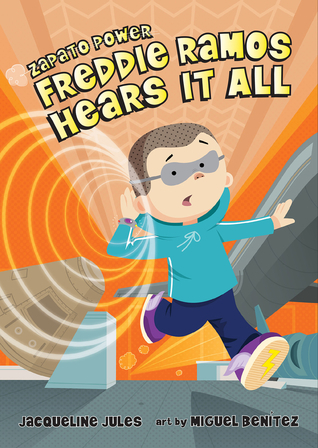 Can Freddie find a way to use his super hearing without snooping? Jacqueline Jules has created a delightful series for early chapter book readers who have a love for superheroes. Freddie Ramos has several devices that give him superpowers (his shoes, a watch, etc.). He tries to use his superpowers for good, such as when he helps a lost little boy at the beginning of the story, but like most humans, he's tempted to use them at other less appropriate times. When he notices that Mr. Vaslov and his nephew have a secret, he uses his power to overhear a conversation. After making some mistakes, Freddie realizes that he needs to be more careful about how he uses his capabilities. 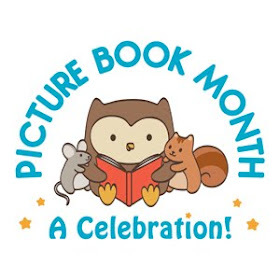 A fun read with lots of superpowers, but also a solid theme of being responsible and owning up to mistakes, this book makes for an enjoyable read for young readers. It’s fall in the backyard, and though the weather is cooling down, the crime solving business is still hot. When the Chicken Squad’s neighbor Anna McClanahanahan comes looking for her missing hamster one morning, it’s an easy case to solve (Ziggy always takes a stroll from 6:30 to 7:15 a.m.). The Chicken Squad is now ready to settle in for a relaxing day of knitting—that is, until Ziggy points out that Barbara, the Chicken Squad’s caretaker—the one who FEEDS THEM! !—is missing! And not only that, but there have been sightings of a headless bear in the neighborhood! Will the Chicken Squad be able to save their beloved Barbara and get some breakfast? Or will this case be too much to bear? The Chicken Squad is on the case. But after solving the case of the missing hamster (in about a minute), the hamster reveals to them that there is another case waiting to be solved. The chickens caretaker, Barbara, appears to have disappeared. And a headless bear sighting in the neighborhood has them all shook up. Using their unusual powers of reasoning and observation, the chicks set out to find their caretaker, and their breakfast. But as is normal with this crew, things don't exactly go according to plan. 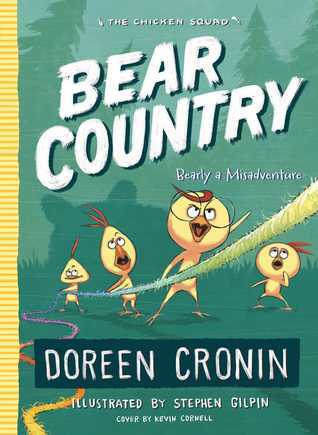 Cronin has written another entertaining book that young readers who like humor, mysteries, and animals are bound to enjoy.